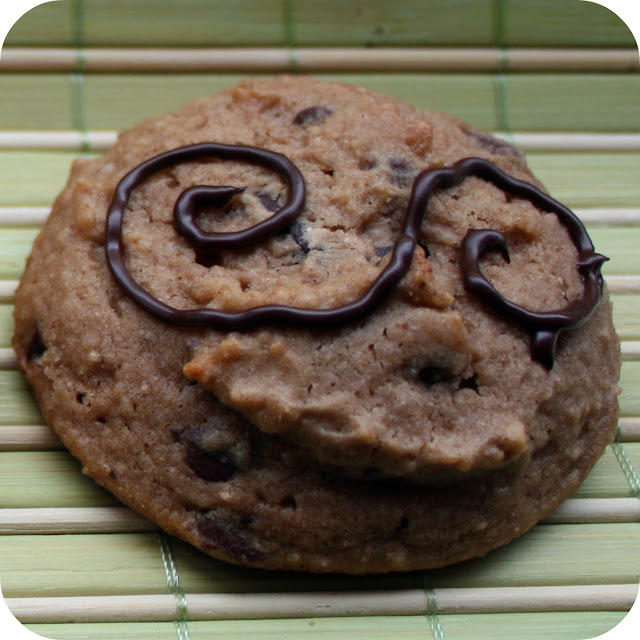 This cookie is so good, it's actually smiling! Do you see the face? For a while now, my blog's name has worried me a bit. Not because I don't like the name, but because I've never really pushed myself to try baking with flour other than wheat, almond, or oatmeal, as the name might suggest. But today I'm proud to announce that all that has changed! I'm going to make an effort to regularly bake with a different flour at least once a month. And to kick things off, I decided to look for the most unusual one I could find: chestnut flour! This past Sunday my family and I celebrated Mother's Day, or as I like to call it, "Let's Spoil The Heck Out Of Mom Day". Seriously, my son treated me like a queen! Not only did I have breakfast made for me, get showered with some awesome gifts, get to go out to one of my favorite restaurants for lunch, AND get to go to Trophy Cupcake for a dessert, I was also treated to a day in downtown Seattle and a stroll around Pike Place Market. This always means a stop at DeLaurenti's which I happen to think is the best Italian grocery store in Seattle. I got a little carried away and bought a bunch of baking supplies. This included "00" flour, some arrack extract (no idea what it is but it smells great! ), candied citron, some really authentic extra virgin olive oil, and a pound of chestnut flour. Now I'll admit that I've never even had a chestnut before but I thought it would be fun to see what I could make with it. As soon as I got home I started my quest to find a recipe. During my research I found out that chestnut flour is very low calories, fat, and carbohydrates! And, to my delight, I found out that it is also gluten-free. This worked out perfectly because just a few days before one of my coworkers, Jay, confided that he's can never indulged in my treats due to his sensitivity to gluten. The moment he said that I knew I had to make him something special. Isn't it funny how things fall into place sometimes? 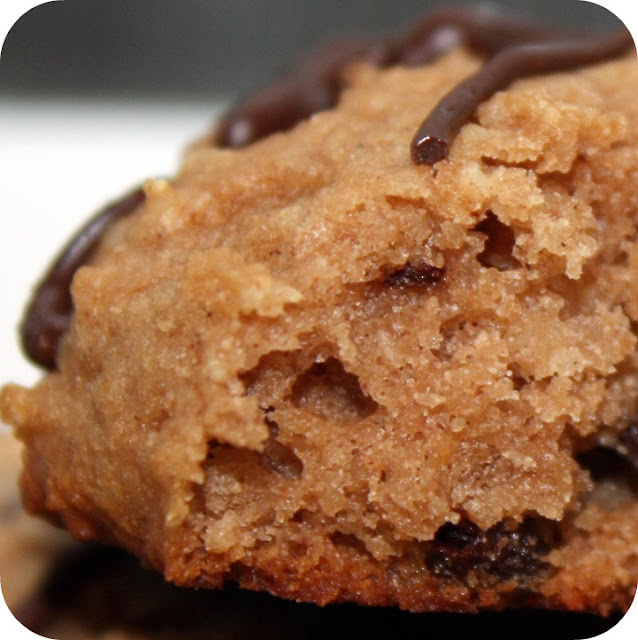 :) It didn't take me very long to find Sara's blog and this insanely yummy recipe. Originally I had wanted to follow it to the letter and make muffins but they fell apart in the pan. However, the tops of the muffins stayed completely intact so I decided to just make cookies instead. Honestly I think they were better than any muffin could have ever been. Thanks *so* much for showing me that its possible to have delicious baked goods once again... your gluten-free dark chocolate coconut/chestnut cookies made me remember how wonderful desserts were. It really made my week! (I'm really at a loss for words...) Please continue to share your love with so many people. They truly are sincere acts of sweetness! Yield: About 24-27 2-tablespoon sized cookies. Preheat oven to 375F. Prepare a cookie sheet with a Silpat mat or line with parchment paper. 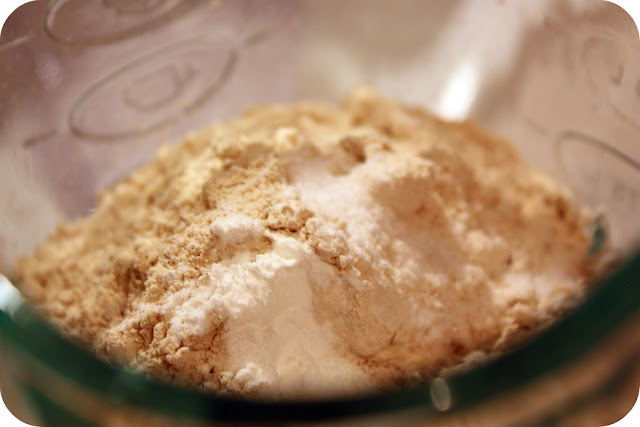 Whisk the chestnut flour, coconut flour, salt, baking powder, baking soda together in a bowl. Set aside. In the bowl of a stand mixer, beat the softened butter for two minutes until light and smooth. Add the brown sugar at high speed for 2 minutes until light brown and fluffy. Add the eggs, one at a time and mix for 30 seconds each. Add the vanilla last and mix again on medium speed for 30 seconds. Add half of the chestnut flour mix and very slowly and mix, pulsing at firs. Add the cream and mix for about 30 seconds until all the cream is absorbed. Add the milk until all the milk is absorbed. Scrape the bowl and the beater blade. Add the remainder of the dry ingredients until well distributed. Add the chocolate and mix until everything is well combined, about 20 or so seconds. 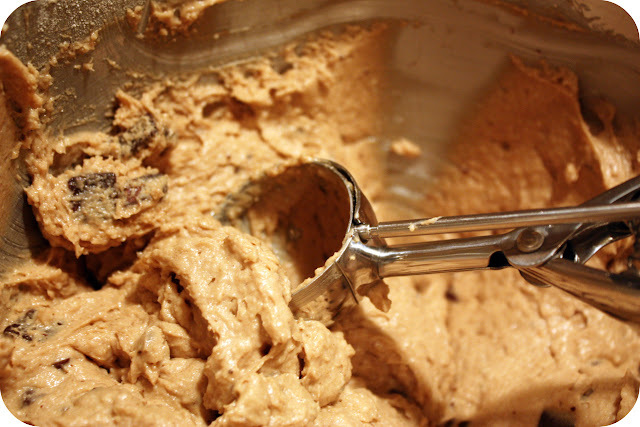 Drop dough using a one or two-tablespoon cookie scoop 2 inches apart onto the prepared cookie sheet. Bake for 9-13 minutes or just until the tops spring back slightly when you touch it. This post caught my attention in so many ways - I LOVE the texture of muffin tops, and I've loved everything I've tried at the gluten-free bakery dangerously close to my apartment! I've actually never had a chestnut, but I'd definitely be interested in trying the flour. I have a suggestion for next month's exotic flour, if you don't have one lined up already: chickpea flour. Mmmmm. Wow...I've never even heard of chestnut flour! These look so good! Awh, that comment from you co-worker was so sweet. Bet it warmed your heart! Those tops looks fabulous! 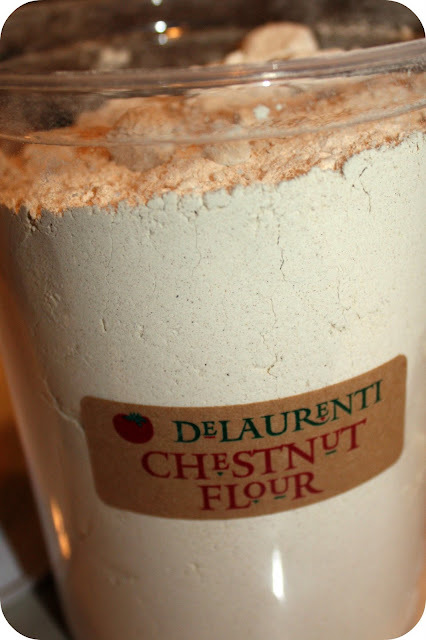 I've never used chestnut flour before, but i'll give it a try some day! I love chestnuts! 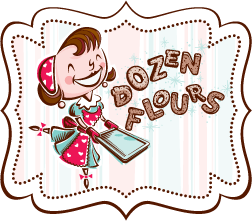 I never knew that there was a flour available~ yum! I love the chocolate design you did on the top... how sweet! And you rock for making Jay's day! That is so very sweet of you to bake for your co-worker. I see it made his day and that's awesome. Julia you are such a thoughtful, giving person. I'm not at all surprised at the lovely message from Jay. I'm happy to hear that those around you recognize how special you are. I've been doing the same thing lately with flours, who knew there were so many kinds. I have a healthfood store by me called "Fruitful Yield" and I have gotten quinoa flour, oat flour, whole wheat pastry flour. I am going to check out the chestnut flour too, that sounds so good. I have a few people in my office who have food aversions, so its nice to make something everyone can enjoy like your friend at work! I love chestnuts, I'll have to see if that flour is in any of my neighborhood stores (I live in an italian neighborhood). Glad this worked out for Jay, as someone with a food allergy, it is nice when people think of you. i'm so glad you got properly pampered on mother's day, and i'm also glad you were able to make some tasty cookies for your co-worker. they look awesome, whether the eater is gluten-sensitive or not! Well I think you blog name is darling! Chestnut flour! That is so interesting!! Glad it was an inspiration, even if things fell apart - not sure why that happened but you made it your own recipe now! I'll have to try cookies, too! 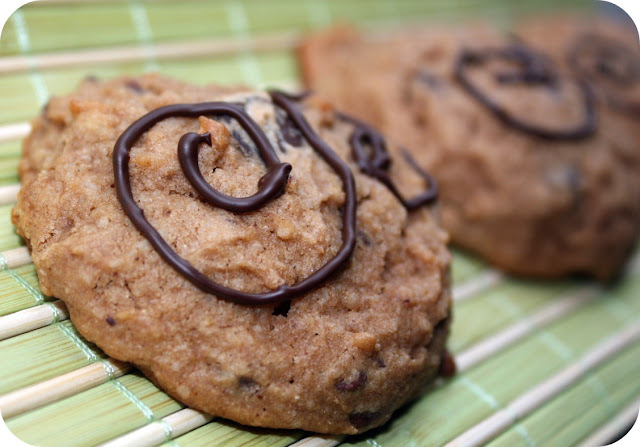 These muffin top cookies sure have a lot of great things going for them. Haven't tried chestnut flour but can definitely attest to the joys of coconut, barley, spelt, and oat flours. As a huge fan of both cookies and muffins I can't wait to give these a try.